I’ve recently wrapped up two months of traveling around Turkey, and I can count on fingers and toes the amount of identifiable foreign tourists I saw. The Lonely Traveller Matt and I lived in and traveled around the country from mid-December to the end of February, and spent our time in Istanbul, Kalkan, Antalya, Cappadocia, and Izmir. 6 days before we arrived, 44 people were killed in a twin bombing attack on an Istanbul football stadium. On New Year’s Eve, 39 more people were killed in a nightclub shooting in Istanbul. These are only two examples of many terrorist attacks on Turkish soil, the combination of which have significantly deterred tourism. Needless to say, friends and family heavily criticized my travel plans. Having already booked flights and accommodation, and not being much of a listener, I went anyway. Now here I am, two months and many adventures later, and after several weeks of incredible hospitality and kindness, I would like to write in defense of Turkey, and possibly restore your faith in humanity. As an American citizen, I am granted a 90-day multiple-entry visa for Turkey. The e-visa is easily and quickly attainable online here, and for me, set me back only $20 (plus a small credit card processing fee). The beauty of this particular visa is that it provides the flexibility of spending 90 days in the country within a six-month period. This means you can visit neighboring countries and come back without issue. If you’re flying from within Europe, Pegasus offers the best flight deals to Turkey that I could find, and also has the lowest baggage fees I’ve seen (next to free) in a long time. For example, a relatively last minute flight from Prague to Istanbul cost about $83 USD with 20 kg of baggage. Matt and I entered the country with no real plans in place, other than a few days in Istanbul and a two and a half week housesit (a topic that deserves a blog post of its own) in Kalkan, a beautiful coastal city in the south, right on the Mediterranean. Through an obscure friend of a friend of a friend scenario, we found ourselves a roommate with an apartment in Antalya (a few hours east of Kalkan along the coast) for a month at the beautifully low rate of $85 USD each. Yeah, that’s just under $3 a day. So Antalya became our base, and as we traveled around, we did our best to keep costs very low. This meant buying local produce and cooking at home, taking cheap buses, hitchhiking, and best of all, CouchSurfing. 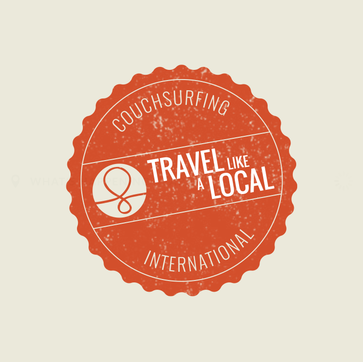 For anyone who doesn’t know, CouchSurfing is an app that connects travelers with locals who have a spare couch or bed available in a given destination. The CouchSurfing app is free, and when hosts offer up a place to sleep, this is also free. This is baffling to some people, and still boggles my brain sometimes, but at the heart of CouchSurfing is a cultural exchange. It’s an opportunity to meet open-minded and generous people and see a new place through a local's perspective. In Turkey, CouchSurfing is particularly popular and as far as I can tell, may play out a bit differently than in other countries around the world. You can post your trip details online, so that everyone can see where you’re going and for how many nights. Then something strange happens: people start contacting YOU offering to host you, rather than the other way around. We had dozens and dozens of people offer to put us up on the 3 occasions that we were looking for one. Ultimately, we accepted 3 CouchSurfs- one in Uçhisar (near Göreme, Cappadocia), one in Izmir, and one in Denizli (the nearest city to Pamukkale). They were all extremely different, and because of this, perfectly illustrate my point about Turkish hospitality across a variety of people. I shall categorize the 3 CouchSurfs as follows: The Single Hostel Owner, The Happy Family, and the University Students. We accepted an offer for two nights from a man in Uçhisar, the tallest point in Cappadocia just a few kilometers from Göreme. Göreme is the main tourist city where everyone stays to see the incredible sunrise hot air balloons (which by the way is one of the most epic things you’ll ever see). We hitchhiked there, and the second car we threw a thumb out to picked us up. The driver was a Turkish English teacher who used to live in Ohio, and worked at Cedar Point, a famous amusement park in Sandusky. Well, my mother’s side of the family is from Ohio and I’ve visited that very same park myself, so that was a small world surprise. We didn’t really know what to expect from our first CouchSurfing experience in Turkey, but were pleased to meet Kamil and his family at what turned out to be a family-run hostel. The hostel was closed at this time for a lack of business, but lucky for us, they open up their private rooms to CouchSurfers. We had our own bathroom, a queen-sized bed, and a communal kitchen to cook in. The hostel was also a short walk from Uçhisar Castle, a Roman rock-cut citadel with one hell of a view. I couldn’t for the life of me wrap my head around this wonderful and free situation we found ourselves in, but it was becoming quite clear that the Turkish people are extremely helpful, social and kind people. Our host was a bit sick during our stay, but we really enjoyed spending our first night with his family, and watching their genuine, phone-free interactions over some food and a fire. I can confidently say American family life doesn’t typically look anything like that. After such a wonderful experience, we were intent on giving CouchSurfing another try in our next destination. From Cappadocia, we headed back to Antalya for a short stint before taking off for Izmir, Turkey’s third largest city on the Western coast. I let Matt handle our accommodation, and he set us up with a CouchSurf with a family a bit outside of the city center. For this particular trip, Matt had upwards of 30 people reach out about hosting us in Izmir, and again, I thought I was missing some big catch. I wasn’t quite sure how a stay with a family would be, but it ended up being a fantastic decision. The father, Onur, picked us up from the metro station and brought us to his adorable three-bedroom apartment. His wife made us delicious Turkish meals, and they put us up in our own room. 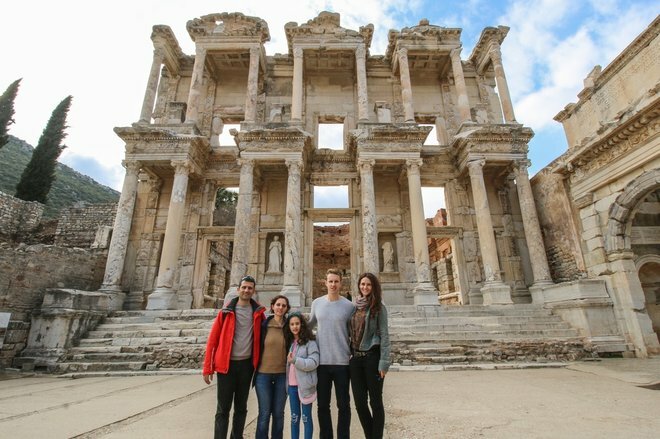 We sat and exchanged stories, and they even brought us to Ephesus, the area’s famed UNESCO site of fabulous ruins. They took us in as one of their own, and having a young, impressionable daughter, it is a testament to their kindness and open minds that they let two complete strangers into their home. We felt so welcome, and the experience was nothing short of heartwarming. Towards the end of our stay in Turkey, we headed to Denizli. Denizli is the closest city to Pamukkale, an incredible UNESCO site with travertine terraces that are easily mistaken for snow, and hot springs that run through them (more on that in a future post). Again, several CouchSurfing offers came our way and we accepted one with a university student named Berk. Having recently stayed with a family, I was imagining a very different experience full of beer, late nights, and potentially obnoxious 20 year olds. I couldn’t have been more wrong. The university student stereotypes that I’ve come to expect from Americans do not apply in Turkey, and that was a beautiful thing for my liver and my love of sleep. Berk had two roommates and a girlfriend, and together, they were the most hospitable group of students I could have expected. Their apartment had a living room that could be closed off by a door and several comfortable couches, which was more than adequate for us. Even still, Berk was offering to let us stay in his bedroom, which we quickly declined. We arrived quite late our first night, and Berk met us on his bicycle at a local restaurant, walked us to a bus stop, and set us up with the correct one to get to his apartment. When we arrived, he whipped us up something to eat, and after, the group hung out and chatted over Turkish tea and cookies. They helped us set up our beds, and I fell asleep under the cover of a thick, red and yellow Galatasaray FC blanket. The next day, Berk took us rock climbing at his university, a new experience for me. At 29 years old, walking around a campus is as nostalgic as it is bizarre, but it was great to see what a Turkish university looks like. At the indoor climbing wall, he taught us the ropes (no pun intended) and we took turns climbing to the top. That night, we had another group dinner, and they wouldn’t let us lift a finger. I had nothing but admiration for these guys. When I was 20, I was watching reality TV, making microwave dinners, going to class, and living in the bubble of Storrs, Connecticut. They’re well ahead of the game, and I’m so happy to have met them. After these three incredible Couchsurfs, I would love to turn the tables and host if and when I finally stay put in one place long enough. CouchSurfing isn’t for everyone, so if my stories don’t inspire you to try it yourself, I do hope they at least help replace any negative images you may have about Turkey with the ones of sincerity, kindness and generosity that I now have. If you've had any similar (or different!) experiences, I'd love to hear about them below!